When learning Thai Massage, you might have several choices between teachers and schools. However few people realize that there is another option which can be perfect for some – learning Thai Massage online. You can learn almost anything online nowadays – playing the guitar, yoga, building a house, law, and a myriad other things. So why not study Thai Massage online as well? Your success with an online course depends on who is teaching it, how the teaching environment is set up, how the support is, if it is right for you, and several other factors. Let’s take a look at them one by one. Which scenario helps you to succeed? If you purchase a Thai Massage DVD with lots of techniques demonstrated, but no support, nobody to ask questions, no training structure, and no student community, then chances are pretty good that you won’t get very far with it. Now imagine this scenario: You enroll in an online program which is set up like a real school: step-by-step gradual learning without overwhelm, helpful teacher support, a thriving and inspiring student community, a system that makes you accountable, and detailed, easy to follow training – wouldn’t that be a different story? This is precisely what Thai Healing Massage Academy is providing, and we have lots of experience with this. We pioneered Thai Massage online training as the oldest and original online institute with structured training and full teacher support. You deserve to know whom you are dealing with. So here is our story, our background, and a close look at what we are offering. Let’s look at 20 reasons (or more) why learning Thai Massage through our online training might be a good choice for you. How established are we and how solid is our training? Thai Healing Massage Academy was founded in 2001. That’s a solid long-term track record. We have trained thousands of students since then, ranging from our free introductory Thai Massage training to multi-month online training programs. Our website was first created in September of 2003 – a solid 15 year online track record. You can depend on us for excellent training and reliable support. Our website is the largest Thai Massage online training website on the internet, and we are a leading publisher of free and paid Thai Massage education. We have a forum with about 14000 posts (as of March 2018). The forum was established in November of 2010. The instructor, Shama Kern, wrote about 6000 of these posts, all in support of our online students. We have an active facebook group with thousands of posts and comments which was established in September of 2015. There are over 1200 members in the group – it’s a great source for interesting education and discussions. What kind of training are we providing? Our training is gradual and structured, just like in any real school. There is no overwhelm and no pressure. You can conveniently learn at your own pace, right from your home. We truly care! We provide the best and friendliest and most personal support anywhere. This support does not come from an impersonal agent in a boiler room somewhere in the world, but from the instructor himself who can communicate in English, German and Spanish. The instructor, Shama Kern, and his Thai wife, who is also a qualified Thai Massage therapist and teacher, founded Thai Healing Massage Academy. They spent two decades living in Thailand, the homeland of Thai Massage, so you can be sure that you receive authentic training with the true spirit of Thai Massage. Some of our larger courses use multi-media formats: video, audio and text. You can watch the videos, listen to the audio on the go, and you don’t need to take notes since you have the written material. You receive excellent, high quality Thai Massage training for a fraction of the high price tag of live courses. We don’t keep charging you for more levels. In our Complete Thai Massage training you will learn everything you need to become a competent Thai Massage therapist. You don’t have to pay for level one, then level two, then level three training. All support is free. Access to the teacher is free. Our international certification program is free (there is a qualification process). All our courses are backed by an unconditional satisfaction guarantee. This makes your investment totally risk free. If it’s not right for you, you get all your money back. You don’t have to do this alone. We have a large, friendly, inspiring student community, both in our forum and in our facebook group. So if you need company, inspiration, advice, want to network, or have questions – there is easy access to all of this at no extra cost. You get to keep all training material permanently. If you forget how something works, you can go back to that lesson and review it. You have unlimited access to the training, and you also have unlimited access to the instructor. This is a big advantage over live training where you lose access as soon as the course is over. Once you have learned the entire system of Thai Massage, you can take it to an even higher level by studying very specialized advanced therapy training courses for various parts of the body or conditions like shoulders, back, knees, sacrum, legs or sciatica. You can also learn similar related massage styles like the excellent “Thai Foot Massage” system, or our unique “Heavenly Head Massage” program, or our “Massage For Friends And Family” course for those who don’t want to go the professional route. Who can benefit from our online Thai Massage training? When is it not for you? You have no previous experience with healing arts or yoga and need some live training to get started, However we do have a course which is specifically designed for people with zero experience or healing arts background – Massage For Friends And Family. The author, Shama Kern, is the founder and director of Thai Healing Massage Academy. 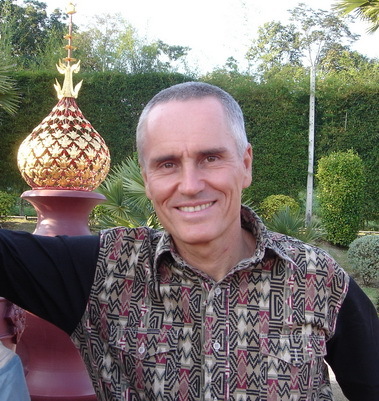 He has been practicing and teaching Thai Massage for close to two decades, and he is the author of 20 online Thai Massage training courses.